[Senior Officer Jamie] Brown said he has been an Oxnard police officer for 17 years and had been assigned to work at other Pueblo Collective marches. Brown said there were others jaywalking but Romero’s “conduct was more egregious” than others. VENTURA CALIFORNIA — Two Oxnard police officers testified Wednesday that community activist Francisco Romero wasn’t targeted when he was given five citations a year ago for jaywalking during a protest march against police brutality. Officers Jamie Brown who issued the jaywalking citations and Jaime Miranda who signed the citations testified that Romero wasn’t targeted by police department. They said Romero violated the law and was the only one out of 150 people who marched on Oct. 13, 2013 who could be identified. A week after the march, Romero received a certified letter stating that he had been given five citations, which have fines totaling as much as $1,000. The jaywalking was recorded by an undercover officer in an unmarked police car, court evidence showed. 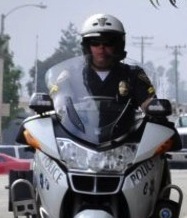 Brown, a motorcycle patrolman, said he was given five clips of a video that lasted three minutes and was told by Sgt. Alex Arnett to review the video and give an “educated opinion” on whether there were jaywalking violations. Brown said he then learned that the person he identified on the video was Romero. Prosecutor Susan Park maintains that Romero was identified and video-recorded jaywalking five times, failing to yield to vehicles during a protest march. She argued that Romero was the only person given jaywalking tickets because police could only identify him and know his address where they can send the jaywalking citations. Park said nobody else at the 2013 march was given any citations. Romero’s lawyer Jaime Segall Gutierrez, of Whittier, claims the Oxnard Police Department conspired from “the very top” to single out his client for prosecution in an attempt to silence Romero’s criticism, violating his constitutional rights. Gutierrez said the evidence will show that the audio portion on the some of the two hours of surveillance video, officers are heard singling out Romero by name during the march. Gutierrez alleges that the officers had to know the names of family members of other police-brutality victims, including Limon’s family, who participated in the 2013 march. In addition, some of the protesters like Elliot Gabriel sometimes attend City Council meetings to speak during the public comments portion of the meeting, said Gutierrez. Gutierrez noted that Romero ran for the Oxnard City Council in 2006 and got 7,000 votes. Commissioner Anthony Sabo who is presiding over the hearing is weighing testimony and evidence to determine whether the issuance of the five tickets violated the constitution as spelled out in the 1975 Murgia vs. Municipal Court Case. The California Supreme Court ruled in the Murgia case that a defendant may be entitled to a dismissal of criminal charges if they can prove that there was selective prosecution for improper purposes. Sabo, as a result of conflicting court schedules, postponed testimony on the hearing until Monday There have been two days of testimony spread over a week. The case was initially prosecuted by the city of Oxnard’s attorneys before it was turned over to the District Attorney’s Office. The defense subpoenas include 12 Oxnard officers. Gutierrez told Sabo that he only intends to put another four on the stand. However, Gutierrez said he might call more officers to testify if he believes it is necessary to support his case. The 2013 march drew 150 protestors and 95 Oxnard officers, including undercover officers and SWAT units, who were assigned to the march as part of a police plan to keep tabs on the demonstrators, according to law enforcement documents. Uniformed police weren’t visible during the two-mile trek, which began at Camino del Sol Park and ended in front of police headquarters. The march was held by Todo Poder al Pueblo Collective. In an interview, Romero, of Oxnard, said Limon’s family approached the group and asked them to hold an anniversary protest march for Limon who was killed on Oct. 12, 2012 by Oxnard police. Romero said he agreed to do so to support the family. The shooting of Limon resulted in the city of Oxnard having to pay $6.7 million to settle the wrongful death lawsuit filed by Limon’s family which is the largest wrongful death settlement for the city of Oxnard. Limon was shot between 16 to 21 times by four officers as he lay on the ground, according to the Limon family lawyer Adam Shea. Brown testified that he observed a three-minute, five-clip video and concluded that Romero violated the law. He said he was told that Romero was the leader of the march. He said there was no audio on the three-minute video. He said he drafted the letter with Sgt. Arnett and another supervisor. But Brown said Romero was given the citation because he violated the law not because he was the leader. He said he didn’t know who Romero was and found out after the 2013 march. Brown said he has been an Oxnard police officer for 17 years and had been assigned to work at other Pueblo Collective marches. Brown said there were others jaywalking but Romero’s “conduct was more egregious” than others. Officer Jaime Miranda said he and officer Jeff Aragon were assigned to monitor the marchers and take surveillance video. Miranda said he believes that he and Aragon recorded about an hour of video. He said he was told by Sgt. Arnett to review the video and give a detailed report about what he saw. He said he was assigned to video record all the protestors. Miranda said Arnett told him to issue tickets to Romero because he was a leader of the group. Romero even spoke at the park where the marchers had gathered before they began walking, according to Miranda. When Romero’s lawyer questioned Miranda about his client speaking at the park, Miranda said he could have been mistaken. “If I am wrong than I am wrong. But I do remember him speaking,” said Miranda. He said he’s conducted surveillance on three other Pueblo Collective marches before the 2013 march. After Miranda reviewed the one-hour surveillance video, he said it was probably given to the “tech guys” who edit it into a five clip, three-minute video. This three-minute video was given to Officer Brown to get his opinion, according to Miranda. Miranda said he believes Brown saw the entire hour-long video. Miranda testified that his 2013-march report identifies two other protestors and the video also shows the two at the march. They are Guillermo Ramirez whose brother Robert Ramirez, 26, died while in police custody on June 23, 2012 and Pueblo Collective member Elliot Gabriel, Miranda testified. OXNARD Unidos con MEXICO: Ayotzinapa vive, la lucha sigue!